Scuppernong (Vitis rotundifolia Michx.) is a type of muscadine grape, named after the Scuppernong River in North Carolina. The grapes grow in a variety of colors from the original green-bronze to yellow to deep purple. Native to the southeastern United States, scuppernongs will grow in sandy soil in USDA Plant Hardiness zones 8a to 11. Temperatures below 10 degrees Fahrenheit will kill the plant. Although scuppernongs are most successfully propagated by layering, it is possible to root the cuttings. Take the scuppernong cutting in late May or early August. Cut 15 to 18 inches of green vine. It should be green but not succulent. Fill a bucket with room-temperature water. 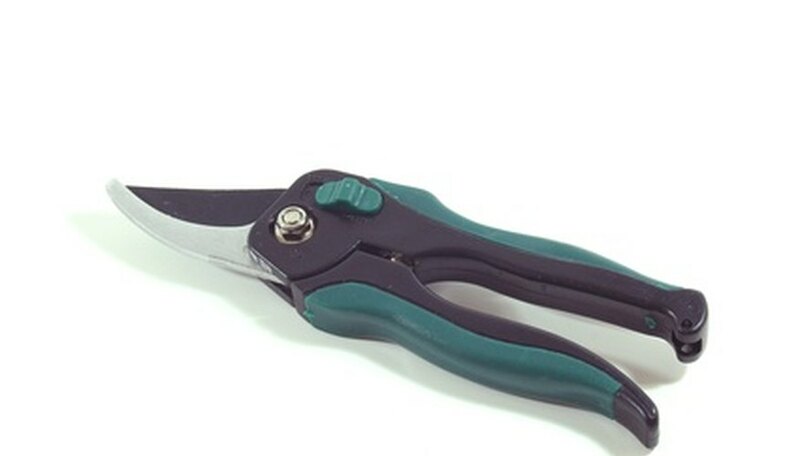 Remove the lower two leaves from the cutting and snip the vine between the fourth and fifth leaves. Place this cutting in the bucket of water. Repeat the procedure, removing the two bottom leaves and cutting between the fourth and fifth leaves until you reach the tip of the cutting, which should be discarded. All the cuttings should be placed in the bucket of water immediately after cutting. Mix equal parts of peat moss, sand and bark and pour it into the planting pots. Insert the end of the cuttings from which you removed the leaves into the soil, burying the two leaf nodes (where the leaves joined the stem). Water the cuttings and mist them with the misting bottle. Place the cuttings in a shady area and mist them frequently. In a greenhouse setting the cuttings will be misted every 10 minutes, so it is impossible to over-mist them. Water the cutting with 1 inch of water a week until new shoots are 6 inches long. Transplant the cuttings into their permanent location in late fall or early spring. UBC Botanical Garden: 100s of Muscadine Grapevines--Now What?